Ask any snowboarder what their dream day would be and most will reply that thigh deep light and fluffy crystal powder are what they seek. 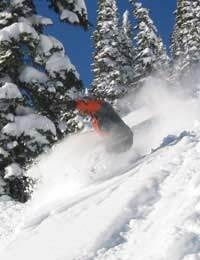 The problem is when the powder does arrive, everybody wants a piece of it, and in most ski resorts, the powder gets tracked out fairly quickly. So, snowboarders are having to go further a field to enjoy their favourite conditions. For those with money to burn, taking a helicopter and being dropped on a remote peak with a few friends is the best way of accessing empty, powder rich slopes. But for those who either can’t afford it, or who simply enjoy going up as much as coming down, - backcountry hiking is the way to go. Backcountry hiking means leaving behind the safety of the controlled ski area, and venturing out into the untouched mountain environment. Without the aid of ski lifts or helicopters, snowboarders must use their own leg power to hike to the top of a slope before riding down. But walking up steep slopes in deep snow is not easy in snowboard boots alone. For this reason, many chose to attach their boards to a backpack, and use snowshoes and poles to help them hike. This method works perfectly well, but has the disadvantage of there being more to carry. On the way up, a heavy board and bindings must be carried, and on the way down, the snowshoes and poles must be carried. Enter the Spit Board. An ingenious invention especially designed for backcountry hiking and touring, the split board is a snowboard which can be split into to skis when going up, and then rejoined into a snowboard when going down. The reduced weight and increased balance are what gives the split board its advantage. The split board is a relatively new invention. Originally designed by a snowboarder who simply cut his own board in half, there are now a small number of professional manufacturers of split boards. Spilt boards also use special bindings that swivel, accommodating both a snowboard stance when descending or a ski stance when ascending. By attaching “skins” to the underside of each half of the board, the hiker can climb steep slopes with comparative ease. Skins are thin layers a material with short hairs on that all face in the same direction and prevent the ski from slipping back down the slope. Split boards cost more than the average board, but it’s also possible to buy a split board converter kit, that allows you to turn any board into a split board. The disadvantage of a split board over a normal board is that they are not as torsionally rigid, so will not perform as well on piste or hard snow conditions. They also weigh more than a regular board. However, for the backcountry snowboarding purist, split boards are the best comprise of weight and speed. When venturing beyond the managed ski boundary areas, it is vital to be aware of the inherent dangers involved. It is highly recommended that you travel with experienced local guides and also carry basic the safety equipment such as an avalanche transceiver, avalanche probe and a shovel. Even more important, is that you know how to use this equipment, and it is advisable to practice on a regularly basis. Going on our first back country hike this weekend! Excited and nervous as none of us have done one before and none of us have a split board but it should be pretty cool!